Sound Therapy is an opportunity to become resonant not only in your body but with the world around you. Sound Therapy is a harmonious and profound way to emotional and physical health through alignment with one’s self and some say (including Pythagoras) your divine nature. Since we live in a Universe of Advanced Harmonics and or Frequencies, everything in our environment and bodies are frequencies in motion. All of this is managed by a cosmic law of attraction. Our intention is to begin an awareness of a well-functioning resonant and harmonic state of well-being. Since everything vibrates at its own level or frequency, navigating daily life can compromise an individual’s well-being; (i.e., noise pollution, chemicals and day to day stress). By introducing “healing sounds” within a field of “harmonics” the body is receptive to receiving sounds which can eliminate disruption – may it just be the fact that it is deeply relaxing. If you think of how we react in a positive way to beautiful music, consider how profound specific healing sounds may be utilized by first the ear, and then the body (Mind, Body, Spirit). Think of it as a way of energetically re-tuning the body through deep relaxation. There are many effective sound modalities. The ones that I have incorporated are Tibetan throat singing, Himalayan singing bowls, essential oils, and most importantly, compositions that are utilizing one of a kind, rare tones and known frequencies. This music is combined with the important addition of added voices to increase the harmonic structure of the sound. Some of the tones I use in this original healing music include the divine tones removed from our musical scale by Pope Gregory during the Gregorian period, 12 tones and rare ancient frequencies found in religious text, the harmonic notes found within the Shumman Frequency, frequency of color, sounds of the planets and more. This music has a powerful effect on negating disruptive energy, unwanted behavior, recoding, alignment and deep relaxation. The Himalayan singing bowls are rare antiques from the 16th and 17th century. Bells, Chimes, Oral toning are also used depending on what is required to achieve desired results. The benefits are numerous and given that we are all in a different place in our spiritual and human evolution, the profoundness of the alignment that takes place will be based on where you are at in your development. What does a Sound Therapy session look like? 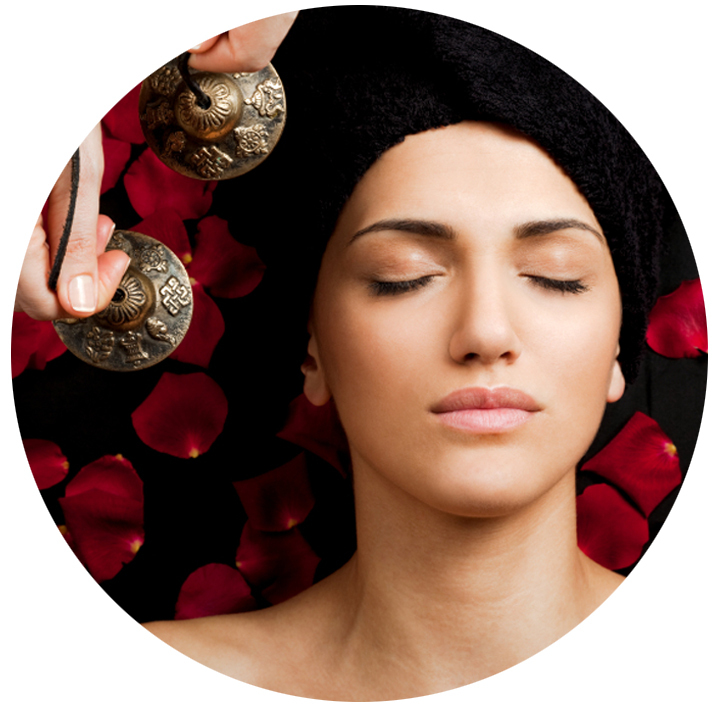 The sounds are played into the body using voice, gongs, singings bowls, bar chimes and music specifically designed for relaxing and healing. These sounds can be utilized by the body on many levels as they themselves are multi-faceted (harmonics). Think of a beam of light. It is white when you look at it but when the beam is split by a prism or a crystal, you can see the individual colors. The same is true of a single note. It has many different layers, or ‘harmonics’, some of which can’t be heard by the human ear but they can be felt in a very deep way. Many of these harmonics are not heard by the human ear, but much in the same way we cannot see the full prism of a beam light, they are present and incorporated into the body on a cellular level. Through years of trial and error throughout centuries, starting with Pythagoras, the first sound healer, we have a pretty good idea of what tones affect different parts of the body, internal and external. However, most responsible sound therapists, play the full spectrum of specific scales which allows the body to take what it needs and disregard what it doesn’t. The price of the sessions are $100.00. 24 hours notice is needed to cancel or you will be charged $40. Activate all of your Chakras using sound on designated points (there are many more than eight. Health is achieved when the elements (Fire, Air, Water, Earth) are balanced. This is an etheric adjustment done with sound. Incorporating sound, adjusting the etheric grid of the body. Allows balance, spiritually, mentally and physically. Should be done in conjunction with Balancing the Elements. Our production team creates your personal composition based on your birth chart realigning original frequencies and strengthening weaknesses. Incorporating sound to connect with your God Self. Can be effective for the following: Feeling disconnected, lost, aimless, migraines, depression? Removing the etheric cap, allowing a re-connection to source. Feeling disconnected, lost, aimless, migraines, depression? Removing the etheric cap, allowing a re-connection to source. Using several modalities to balance and align – all done with music. Using sound and spoken meditation. When emotionally attached to others, they create emotional cords, that connect from one person to the other. The cords serve as a means to staying emotionally connected to the other at all times, even when the other person is not in the same physical vicinity. Cord cutting useful for unhealthy relationships. The aura extends 50 feet from the body. In this healing, we will be looking and feeling for areas where there is energy disruption. Removing disruptions from the body’s energy field. DISCLAIMER: By agreeing to receive healing work from The Michigan Center for Sound Healing, you are giving permission to look into the various levels and dimensions of your being and offer advice or healing energy to help you move forward in ways that benefit your soul growth, happiness, and well -being. We cannot make any guarantees of accuracy of information, and we cannot guarantee any healing results. The only guarantee we can make is that we promise to do our very best to serve you. Our highest priority is to assist you on your spiritual path. Your safety, happiness, growth and well-being come before everything else during a session for the good of all and harm to none. Nothing we say or do during a session is to be construed as offering medical or legal advice. You are requested to seek the advice of a licensed health care professional or attorney for such matters.